This is a FUN (which we REALLY need these days) Technicolor musical full of dancing, singing (duh), and witty humor! The tale centers on a trio: Don Lockwood (Gene Kelly)- popular star of MANY silent films, Cosmo Brown (Donald O’Conner)- Don’s comical accompanist/best pal, and Kathy Selden (Debbie Reynolds)- a unknown talent that Don meets by chance. He brags about his work, BUT she is NOT impressed, calling herself a serious actress who works on the stage (NOT film). 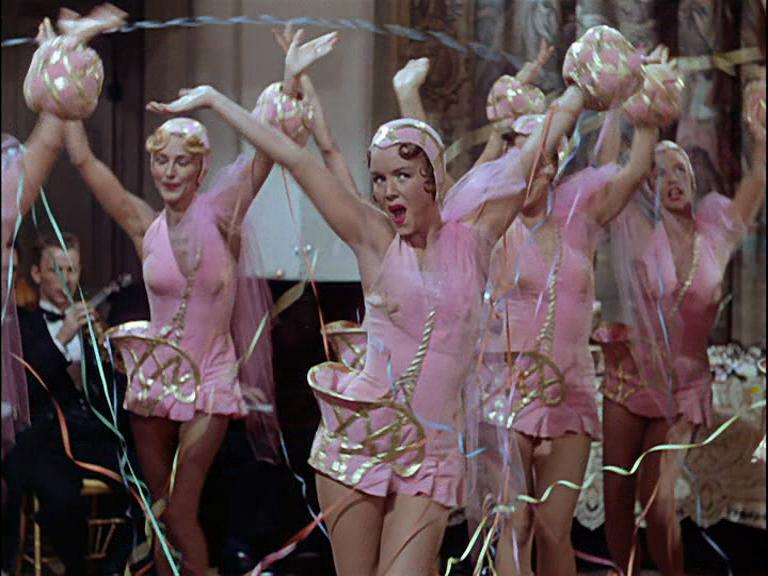 Kathy Selden (Debbie Reynolds) performs at a party, along with other dancers. At a big studio party one night, Don is amused to discover Kathy popping out of a false cake and performing w/ a troupe of dancers. Don’s co-star/wannabe fiancee, Lina Lamont (Jean Hagen), is VERY jealous when she sees him chatting w/ Kathy. Don has NO romantic interest in Lina, who is a self-centered bimbo, BUT the magazines have linked them together (w/ help from their studio). 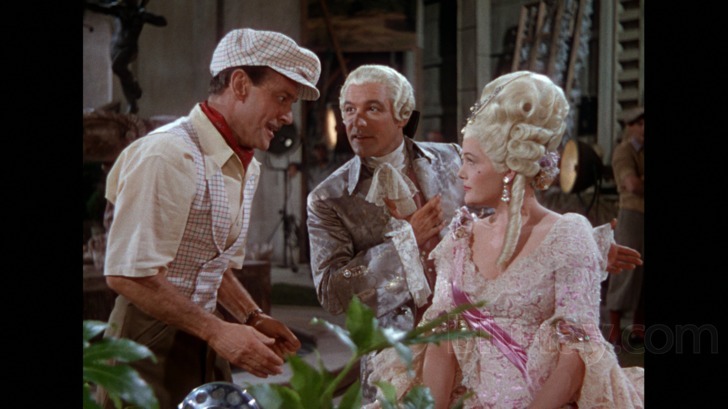 A director talks to Lina Lamont (Jean Hagen) while Don Lockwood (Gene Kelly) watches. The studio head insists that Don and Lina make a talkie next; silent films are on the out (audiences are crazy for sound). The MAIN problem: Lina, though familiar to moviegoers, has a terrible voice (screechy w/ an unrefined New York accent)! Hmmm… HOW will this get solved? 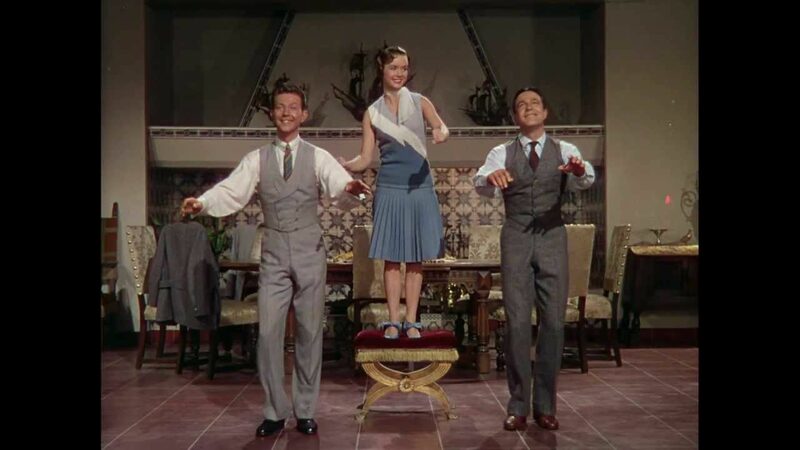 Cosmo (Donald O’Conner), Kathy (Debbie Reynolds), and Don (Gene Kelly) perform “Good Morning”- an impromptu song. Don and Cosmo realize (after spending some time w/ Kathy) that she has MANY talents, incl. her lovely voice. SHE can do the talking for Lina in the new film; after that, she will get HER own work. What could go wrong? 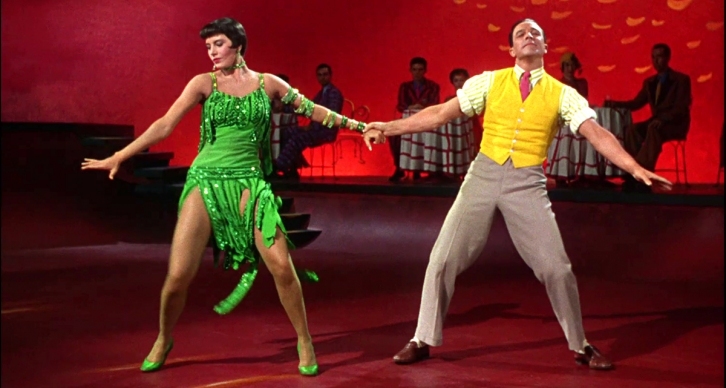 Cyd Charisse (famed dancer/choreographer) with Don (Gene Kelly) during a number. There is some VERY interesting trivia re: this film. In 2007, the American Film Institute (AFI) ranked this as the #5 Greatest Movie of All Time. Reynolds (only 19 y.o. when filming began) was NOT a trained dancer; Fred Astaire saw her crying on the set (after Kelly insulted her), and decided to help her prepare. After the “Good Morning” number, Reynolds had to be carried to her dressing room b/c she had burst some blood vessels in her feet- OUCH! Are you a fan of Star Trek: Deep Space Nine? Cyd Charisse is the maternal aunt of Major Kira Nerys (Nana Visitor); you’ll see the obvious resemblance.